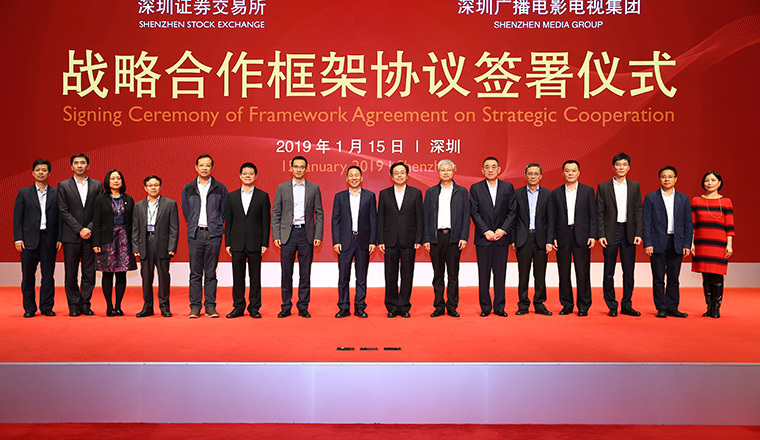 Shenzhen Stock Exchange (SZSE) and Shenzhen Media Group (SZMG) signed a strategic cooperation framework agreement on January 15, 2019. This is a significant move of SZSE to promote transparent operation and further deepen the cooperation and exchange with media. The signing ceremony was attended by Li Xiaogan, member of Shenzhen Standing Committee Municipal Committee and Propaganda Minister, Liu Wenbin, head of the Cultural System Reform and Development Office of the Shenzhen Municipal Government, SZMG President Yue Chuanjiang, Chief Editor Su Huijun, General Manager Liu Zhangbiao, SZSE President and CEO Wang Jianjun, and Vice President Peng Ming. SZSE and SZMG have maintained close contact and cooperation with each other in recent years. The two parties have made joint efforts to spur innovation, promote green public welfare and carry out investor education. Under this agreement, the two sides will gear towards supporting innovation and entrepreneurship and serving the real economy. They will deepen cooperation in enhancing news communication, constructing public welfare platforms, building media think tanks for the Greater Bay Area and promoting sharing of financial news and information. By sharing resources with each other and completing each other's advantages, the two are determined to explore a "finance + media" cooperation model, by which they can spread positive energy about the market and guide the market expectation, so as to create a healthy public opinion environment for the construction of a normal, transparent, open, dynamic and resilient capital market.